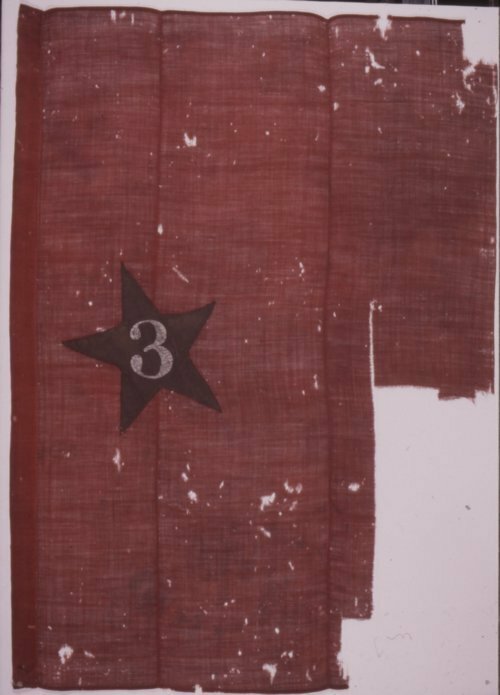 This is the cotton and wool brigade flag of the Twentieth Army Corps, First Division, Third Brigade. The 8th Kansas Infantry was a regiment in this brigade, as was the 15th Wisconsin Infantry. When Colonel Hans Heg of the 15th Wisconsin was killed at Chickamauga, Colonel John Martin of the 8th Kansas took command of the brigade. Martin presented Governor Thomas Carney with the flag at Leavenworth in April, 1864.